Technology and conservation are indispensible to our understanding of the history of religious art. Material and technical aspects of historical art works yield a great deal of information about provenance, and thus reflect the cultural networks that characterized the world that produced them. Furthermore, the imagery and decoration of art works express their religious meanings, while details including reworking and damage may inform us about their use (or disuse) in liturgy and devotion. 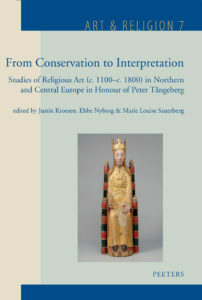 Editors: Kroesen J.E.A., Nyborg E., Sauerberg M.-L.